I heard Paul Jones lecture this fall and was pleasantly surprised at his detailed and conservative approach to church music. Jones is music minister at Tenth Presbyterian Church in Philadelphia where he ministered under Dr. James M. Boice for a number of years before his death. 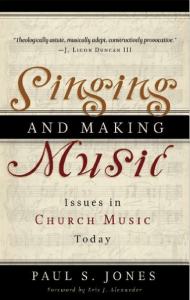 Jones is admittedly Presbyterian in his style of church services and music but is refreshingly candid about the need to reeducate our lay people in sacred music without going overboard in liturgical style.